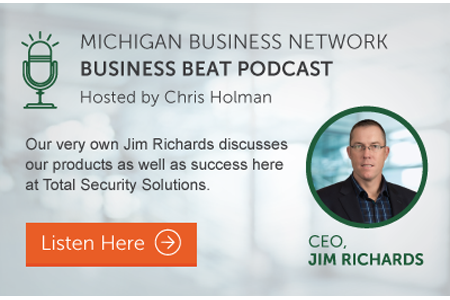 The team at TSS is very proud to announce that our CEO, Jim Richards, was invited back to the radio show Business Beat on December 11, 2014 to speak with host Chris Holman. Jim made his first visit to the show in 2012 after being selected as one of the “Michigan 50 Companies to Watch” by Michigan Celebrates Small Business. Michigan Business Network.com (MBN) is both a website and an Internet radio broadcast, designed to be a hub for business communication in the state of Michigan. MBN provides 24/7 news and information as well as “how to” programs about all aspects of running a business. Established in 2011, MBN is the vision of founder Chris Holman, a well-known entrepreneur, media personality, and small business advocate from Lansing. On the show Business Beat, Chris Holman talks with a wide range of entrepreneurs and business leaders to spread the word about economic development, new or unusual entrepreneurial initiatives, and successful business practices from different regions and industries around Michigan. The Business Beat show runs 8:00 AM every Monday through Friday, with replays at 2:00 PM, 8:00 PM, and 2:00 AM. In particular, 2014 is highlighted as an exciting year for Total Security Solutions with the celebration of its tenth anniversary, as well as being honored with the prestigious Inc 5000 Award. Total Security Solutions plans, produces, and installs bullet proof barriers that are aesthetically pleasing. We specialize in custom bullet resistant barriers, bandit barriers and bulletproof enclosures that fit the design of your work environment , including a variety of standard and custom bullet proof doors and bullet resistant windows.